The idea of Final Draft and Movie Magic Screenwriter 6 and all the other script writing software packages out there is, ostensibly, to liberate the screenwriter from drudgery of formatting her own script. But even as helpful as they are, sometimes we happy typists just need all of that to simply get out of the way. Upon firing up Highland for the first time and slamming out some words, it occurred to me quite plainly: I’ve been doing it wrong. So many years dealing with mega screenwriting software suites and clunky interfaces. I’m happy to report that Highland does away with the bloat, and it does so in spectacular fashion. The only thing Highland asks from you in return is for you to sort of give up your notion of how a screenwriting app should work. That’s because it doesn’t necessarily look like Highland is formatting your script as you go. But alas, as I’m about to show you, it’s all under the hood. That right there, my fellow screenwriters, is a prime example of a piece of screenwriting software getting the hell out of your way. Ironically, Highland’s creator, podcaster John August, never intended Highland to be a screenwriting program. 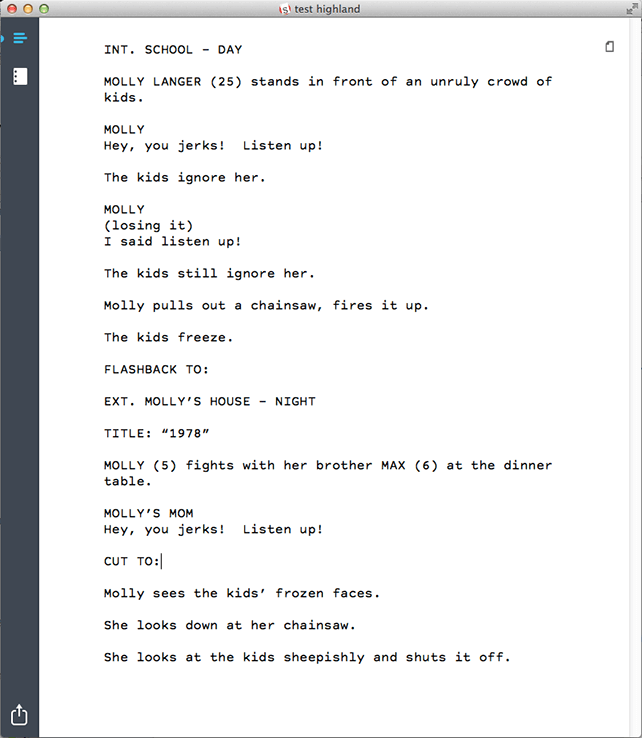 It was created to facilitate the conversion of files between the Fountain markup (a screenwriting markup/set of rules that enables easy creation of properly formatted screenplays using any simply text editor) and Final Draft and PDF. No muss, no fuss. And it imports and exports just fine to/from Final Draft and PDF. Highland has some other great features as well, including a “Dark Mode” for writing in low-light situations (or if you just like writing scripts with a darker screen and bright text), the ability to embed notes (great for collaborating). But Highland’s true strengths, in my opinion, are its lightweight, elegant interface and its typography. Seriously, my scripts look really nice with this app. Not to mention Highland files are openable with any text editor, making them super easy to share or backup or open across a variety of platforms, old and new. That’s not to say Highland is a perfect screenwriting platform for everybody. Where it excels in elegance and typography and cross-platform simplicity and price, it’s a bit lacking in what I call the Obligatory Palette of Screenwriting Program Features™: revisions, outlining, page locking, character breakdowns, etc. – all that you won’t find in Highland, and you might need it. A program like Slugline might be more your speed if you need a few more “tools” in your screenwriting app, while still not giving up a lot of the elegance and simplicity of the interface. I did a review of Slugline a while ago and you can find it here. If you’re looking for a bit more of a “zen” experience for your minimal screenwriting, and are willing to forgo some of the basics any good screenwriting program should have (namely, the actual formatting of your script), then you might like the new app Typed from Real Mac Software. Typed features a stripped down, super-clean interface with attractive typography that let’s you simply, well, get into your screenwriting (or writing). It has very few features, but it might be all you need on your tablet or phone to get a conversation between two characters. And here’s what your type looks like. 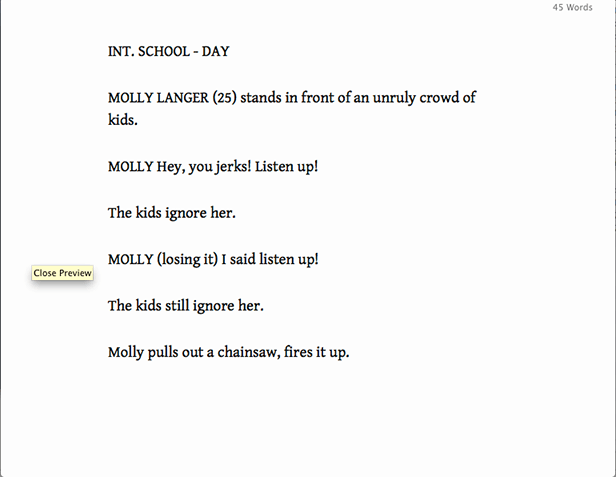 Note, Typed doesn’t format your script, but it does make the writing process pretty and minimal. What I’ve typed here could be saved out of Typed and imported into Highland and Highland would then do all the script formatting for you. One feature about Typed you might like is the ability to write along to a series of meditative “sound tracks” built into the app, ostensibly for the purpose of letting you achieve full writerly zen while you bang out next year’s gross-out chick flick. For me, that sort of thing gets filed under “gimmicky,” but you might find it perfect for your writing style. Typed is fast and easy and clean, and succeeds, as Highland and Slugline do, in letting you frame out the distractions and focus on your writing. In this mad, mad, mad, mad world, that’s something every screenwriter can use. 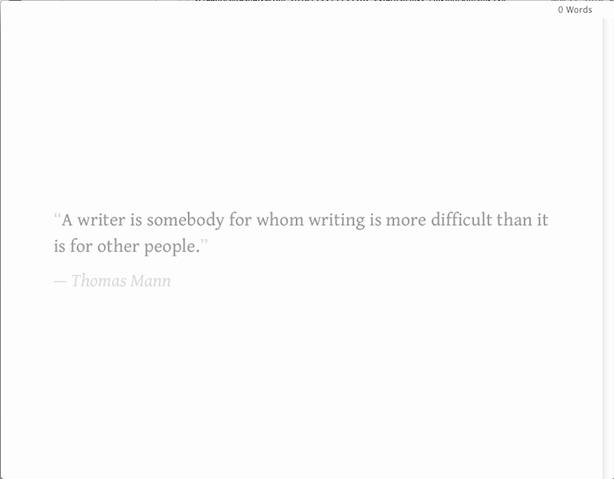 Not sure if you like the idea of “distraction free screenwriting?” Try it for free at Zenpen.io. Zenpen pretty much captures the spirit of Typed and other minimalist writing platforms, but does it with a free web-based app. Simply hit the website and start typing. You can download your work as you go as HTML or markdown or plain text. 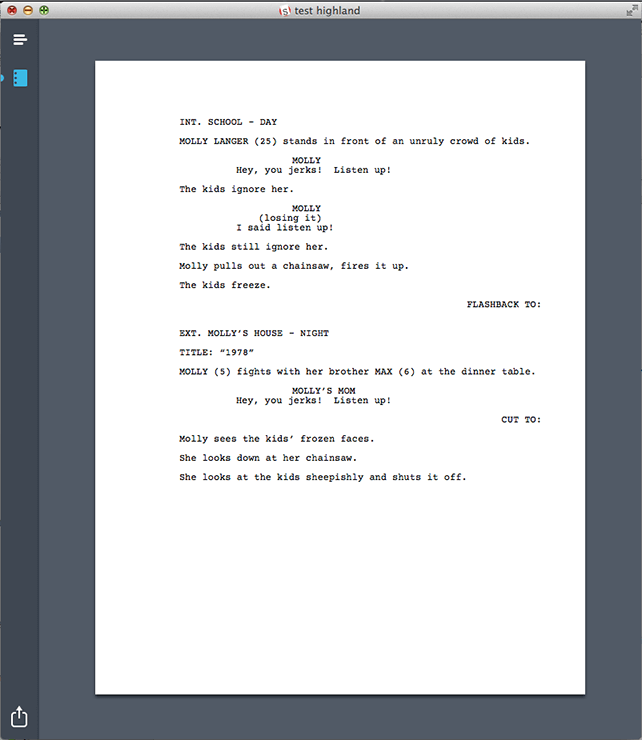 Zenpen, similar to Typed, doesn’t format your screenplay as you go, but with an app like Highland, it doesn’t matter. Highland will import whatever you’ve typed in any other text app, whether it’s Zenpen or Typed or even the built in Notepad on your Windows machine or Quick Edit on your Mac. Here’s what it looks like, below. Note the four simple icons in the left column. They’re for Full Screen, Dark Mode, Word Count, and Save. That’s it. Whatever you think of minimal screenwriting, it’s here to stay. Some writers will prefer to stay with their full-featured screenwriting software suites like Final Draft and Movie Magic Screenwriter, and some will prefer to pare down their software package and write in a more elegant, cleaner, simpler way. The good news is, with Highland, and with Final Draft embracing Highland’s underlying screenwriting markup language, Fountain, you don’t have to choose one over the other. They can work together. Keep Final Draft and Screenwriter’s full roster of scriptwriting features: outlining, index cards, breakdowns, collaboration, etc. but when you need to strip it all away and simply write, or, write simply, with Highland, Slugline, Typed, and Zenpen, you can do that too. I work fo John August, in his small software and games company. We make Highland 2. We saw your review of Highland 1 and would like to offer you a code to try Highland 2 for free. We would love for you to try it and see if you can make another review. Also, we have the release of a new update coming soon that has a bunch of new cool features and it would be great if you are among the first to try it before it comes out. Of course no pressure at all in regards to any of this.